InTouch SmartCards presents the Thuraya SG-2520, a breakthrough in satellite communication technology. As the world�s smartest and lightest dual-mode satellite mobile phone (170g), the Thuraya SG-2520 offers dynamic performance, inimitable style and innovative features surpassing all other available satellite-based products. Using cutting edge satellite technology, the Thuraya SG-2520 is an advanced "smart phone" with 3-in-1 integrated technologies (satellite, GSM Tri-band and GPS) offering users an unparalleled combination of quality and performance. The satellite service option in the Thuraya SG-2520 allows you to roam across nearly one third of the globe, from border to border; in urban areas and remote locations providing the advantages of easy mobility and seamless service beyond land-based telecommunication systems. 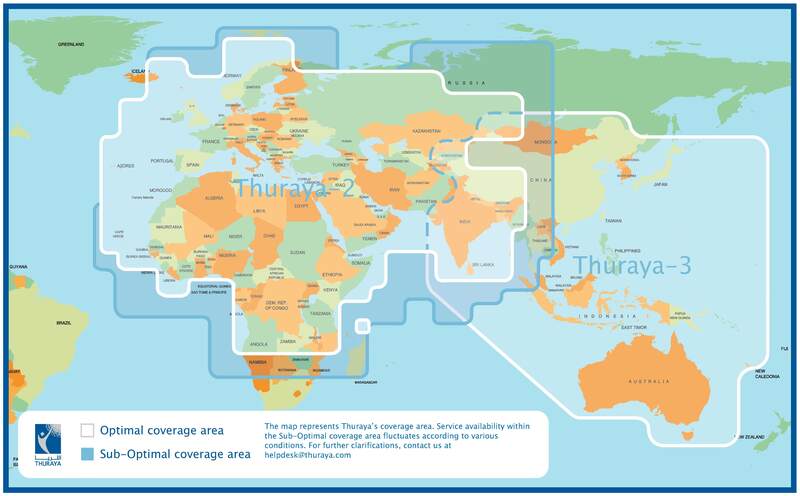 This means that if you are in Thuraya�s coverage area you can make and receive calls anywhere in the world. And when outside the coverage area, you can also use your phone within a GSM compatible network. The Thuraya SG-2520 is the only satellite tri-band phone that provides connectivity on 900/1800/1900 MHz GSM networks offering greater flexibility in high traffic GSM environments with increased phone usability and voice quality in Asia, Africa, Australia, Europe and North America. The Thuraya SG-2520 offers superior GPS navigation capabilities that allow users to find locations and reach destinations quickly and safely. The Thuraya SG-2520 is GmPRS enabled. The embedded micro browser facilitates convenient Internet access. You can download/upload information at speeds of up to 60/15 kbps using Thuraya�s satellite network anywhere in Thuraya�s coverage area. A high resolution, 262,000-colour user friendly display [1.9 inch] enables easy viewing of the phone�s multimedia applications. Thuraya SG-2520 supports 12 languages including Arabic, English, Farsi, French, German, Hindi, Italian, Portuguese, Russian, Spanish, Turkish and Urdu. Thuraya SG-2520 supports a variety of applications based on Java (J2ME).